“Nobody says ‘penultimate’”? I will! 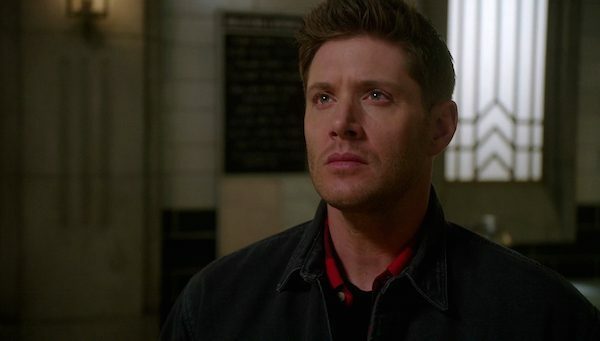 It’s the penultimate episode before the two part season finale, and hunters are dropping like flies, Mary is under the BMoL’s thumb, and Crowley’s totally losing it. I absolutely hated that this episode started with the death of Eileen Leahy. She was smart, she was plucky, she was lovely, and I hate that Ketch sicced a borrowed hellhound on her that clawed her to death. Sam and Dean find out about her demise from Jody, while they are out searching for Mary. 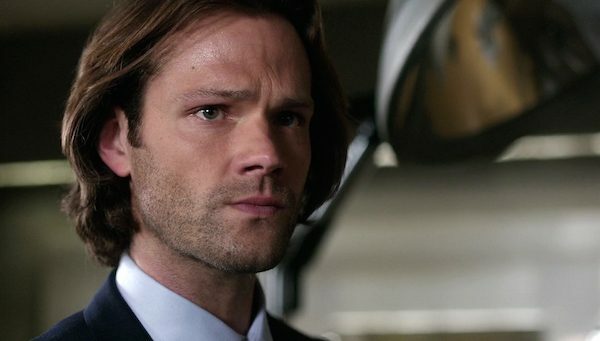 Kudos to Jared Padalecki, who played Sam note perfect when he heard the news. Sam clearly had affection for Eileen, but he also knows the reality of hunter lives (and deaths.) His poignancy and frustration at her loss was just enough. “I want to punch something in the face,” Sam says. Me too, Sam. Me. Too. Mary meets up with a hunter named Rick, and before we know what hit us she attacks and kills him. Or did she? Mary’s been having bad dreams since her capture by the BMoL, and she can’t quite tell fact from fiction anymore. Of course, Toni lets Mary know that she is being brainwashed to kill American hunters for the BMoL, and that, soon, her mind will no longer be her own. (I must say, Elizabeth Blackmore does her job as Toni—I utterly despise her when she speaks. And when she doesn’t.) When Mary tries to deny Toni, she punches Mary in the nose, and that’s when Mary sees the defensive wound on her hand that is very real. The one she received when she killed Rick. Looks like Crowley knows the BMoL—he meets with Dr. Hess and asks if they will have the same arrangement in America that they do in the motherland: Crowley is allowed to reap those stupid enough to sell their own souls and, provided he doesn’t interfere and acts as an informant, he can go about that business unharmed. Turns out he was the hellhound lender (grrrrrrr….) Hess tells him that she knows he is cozied up to the Winchesters and hopes it won’t be a problem if she kills his friends. And will it? Since he’s lying to the Winchesters about his involvement in Eileen’s death, maybe it won’t. 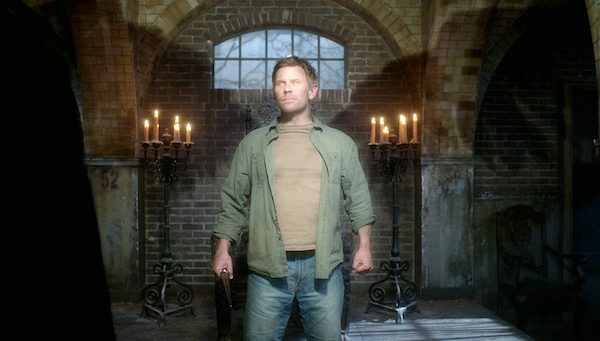 Lucifer’s imprisonment may be short lived—it seems that Crowley’s hold is weakening and in fact? Is reversing polarity (? )—the power going from Crowley to Lucifer. (Yeah—I don’t get how that happened either.) 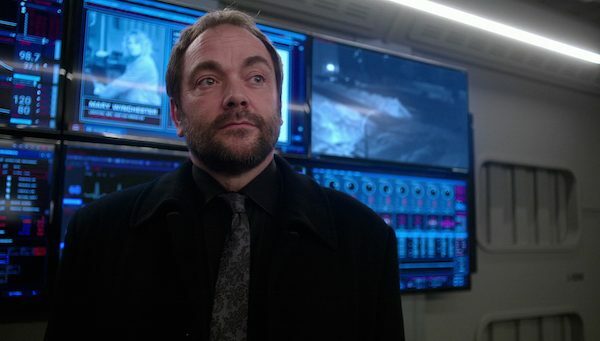 Crowley, none the wiser, tells Lucifer that Dagon is dead and that Cas has Kelly Kline. He wants the nephilim to live, to be raised as Crowley’s own. Lucifer, somewhat confident that he will be free, passes. Soon enough, he’ll hold the upper hand. And when he finds out? 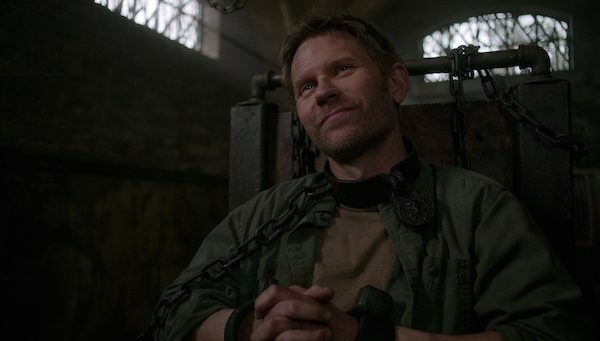 He is nothing short of delighted that Crowley will be his puppet. Eileen (sigh…still not over it) sent Sam and Dean a letter letting them know she was back in America because she was scared. They followed her. Tapped her phone. Bugged her room. Sam’s voice breaks a little as he reads her letter back, and it is heartbreaking. And then? The hunt begins, and this time it ain’t for a monster. It’s for a microphone, which they find under the bunker map table. 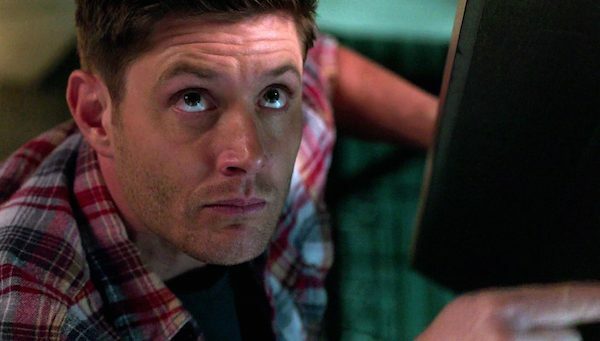 Dean plants the seed that they are going to meet up with an American hunter and Sam plays along. They’re going to lure the BMoL to them and find out what the hell is going on. Toni and Ketch continue to angle to be Dr. Hess’ favorite, each eager to take over Mick Davies’ old position as the newly in charge of BMoL America. Mary then summons Ketch and he goes to her. She is broken, confused, and begs him for help. She goes to embrace him, but it turns out that all she wants is his gun, to kill herself. Ketch stops her. She begs him to kill her. She worries that she is putting the boys in danger. Ketch is sympathetic, but he tells her soon her brainwashing will be over and she won’t even blink at the thought of killing anyone the BMoL wants her to. Sam and Dean go to the rendezvous point, and so does Toni Bevell. She manages to knee Dean in the groin (“You keep that up,” he says, “We’re gonna have to start dating.”) but soon enough, Sam and Dean have her at gunpoint (how satisfying is it to see Sam staring her down from behind his piece?) and in the back of the Impala. Toni remains sassy and annoying, saying they probably killed Eileen, Mick is dead, oh, and Mary was banging Ketch, which pisses Dean off to no end (no one insults Dean’s mom and gets away with it). She tells them the American hunters are going to die—Jody, Claire, all of them. And she says it with both relish and certainty. The boys go back to the Bunker with Toni in tow, planning to call Ketch. 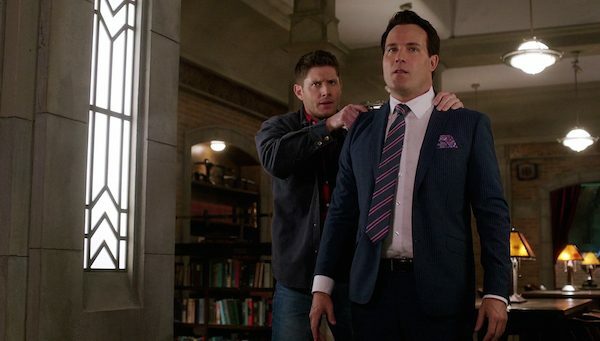 Unfortunately, the element of surprise is gone, because Ketch is already there. 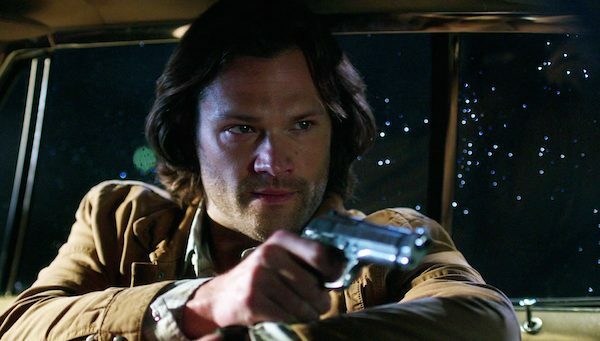 The boys are outnumbered, all should be lost, but they’re the FREAKING WINCHESTERS, and they end up pulling some gun tricks that would be right at home in an old west show. The gunplay is awesome, Dean shooting behind his back, Sam twisting Toni such that he shoots a BMoL dude and keeps her prisoner. There’s only one thing that could pervert all this. And it is…. Sam has Toni. Dean has Ketch. What could stop them now? An armed Mary Winchester, not there to save them, but to take them prisoner. “I really wouldn’t move,” Ketch says. “She will shoot you.” Toni and Ketch tell them Mary has been converted to the BMoL, and all the American hunters are as good as dead. Mary and Ketch ascend the stairs and Toni starts to follow but Ketch will have none of that. He’s leaving her with the Winchesters in a locked bunker with only two days of oxygen. (Smart plan? Not really. A little too Dr. Evil for my tastes. But two days to solve their conundrum suits me just fine.) And we leave off with Mary and Ketch, driving away, her cold and blank, and Lucifer, free at last, surveying his kingdom, ready to find his son and be the father he’s always wanted to be. Season finale next week, folks! See you next time with a mega-coven…I mean, mega-recap for episodes 22 (“Who We Are”) and 23 (“All Along the Watchtower”).